The Chrysler Aspen is a sport utility vehicle from Chrysler. Launched for the 2007 model year, the Aspen is essentially a rebranded Dodge Durango SUV. The Aspen name was previously used by Dodge (on a twin of the Plymouth Volaré) from 1976 to 1980. It is the first truck-based Sport Utility Vehicle commercialized under the Chrysler brand, although the PT Cruiser was the first truck-based Chrysler brand vehicle in terms of CAFE fuel economy standards. 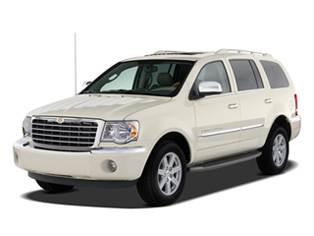 With this introduction, as of 2006, all American automobile brands have an SUV in their range. The car was unveiled at the 2006 North American International Auto Show. The Aspen also comes equipped with three rows of seating for 8 passengers and all-wheel drive. The Aspen comes in one series, the Limited, with several equipment packages available to customize the vehicle to one's individual tastes. Only a few standalone options are offered, in keeping with the Aspen's market positioning as an upscale SUV[who?]. There are three engines available, a flex-fuel 4,701 cc (4.701 L; 286.9 cu in) V8 (capable of running on E85 or gasoline in states where E85 ethanol is legal under emission standards), a gasoline 4.7 L V8 (for California and other states where the E85 4.7 L V8 will not meet emissions requirements), and the 5,654 cc (5.654 L; 345.0 cu in) Hemi V8 with MDS. A hybrid version of the Aspen was introduced for 2009. It features the 340 hp (254 kW) 5.7 L (345 cu in) Hemi engine with MDS as well as the new Two-Mode Hybrid system developed with General Motors and BMW. Reports by Chrysler indicate a 25% gain in highway fuel economy and a 40% gain in the city. Chrysler announced that the 2009 Chrysler Aspen Hybrid would have a starting MSRP of $45,570. On October 23, 2008, Chrysler announced that the shutdown of the Newark Assembly facility producing the Dodge Durango and Chrysler Aspen would be moved up to the end of 2008, effectively ending production of the Aspen and Aspen Hybrid for the 2009 model year. Production ceased on December 19, 2008. With the Pacifica having been discontinued after the 2008 model year and the Aspen following suit a year later, this leaves Chrysler with no SUVs after the 2009 model year, and it is unknown if the Aspen will return or not. Unless you need to tow a boat or a big trailer, the flashy 2009 Chrysler Aspen's moment has passed -- even with the new hybrid. Powerful V8 engines, generous towing and cargo capacities, simple interior controls, high-tech features, hybrid model's enhanced fuel economy and power. Poor gas mileage of regular models, cramped second-row legroom, rough ride, numb steering, subpar interior quality, hybrid sticker shock. The big news for the 2009 Chrysler Aspen is the addition of a hybrid model that combines Hemi V8 power with V6-like fuel efficiency. For the regular Aspen line, the 5.7-liter Hemi V8 makes more power with no fuel-economy penalty, thanks to cylinder deactivation. Sirius Backseat TV is now included with the rear-seat entertainment system. Truck-based chassis. Fifteen-mpg-combined fuel economy. Less passenger space than a big crossover. With all that's going against it, the 2009 Chrysler Aspen is looking like a lonely Neanderthal surrounded by smarter Homo sapiens. A new "two-mode" hybrid is a last-minute attempt to evolve for changing competition, but it seems unlikely to be enough to save this outdated SUV. The Aspen is essentially a Dodge Durango gussied up with more chrome and more features. But it remains a truck-based SUV, which means a body-on-frame design (rather than the increasingly more common carlike unit-body design of crossover SUVs) and rear-wheel or four-wheel drive. This rugged construction does lend itself better to towing and off-roading. And its size -- bigger than a Ford Explorer but smaller than a GMC Yukon -- has typically been touted as an advantage as well. That body-on-frame construction also lends it a rough-and-tumble ride and a heavier curb weight that requires big-time engines that have big-time fuel consumption. Having said that, one of the Aspen's most impressive features is its optional "Hemi" engine. Packing 376 horsepower, the 5.7-liter V8 features cylinder deactivation technology, which helps return fuel economy no worse than that of the Aspen's smaller standard V8. For the best fuel economy, there is the new-for-2009 Chrysler Aspen HEV hybrid. Utilizing so-called "two-mode" hybrid technology co-developed by General Motors, BMW and the company formerly known as Daimler-Chrysler, this powertrain features a de-powered version of the 5.7-liter V8, plus a pair of potent electric motors and a trick transmission with variable gear ratios, which maximizes the efficiency of both power sources. The result is combined fuel economy of about 20 mpg, a 5-mpg increase over the regular 5.7-liter V8. Unfortunately, all that hybrid hardware jacks the Aspen's price up by $3,000 over the similarly equipped non-hybrid model. With all its chrome trim, the Aspen is fancied a budget competitor for full-size luxury SUVs like the Cadillac Escalade, Lexus GX 470 and Lincoln Navigator. Given its smaller size and lower materials/build quality, though, it really isn't in their league. The Aspen is really just a flashier alternative to the Durango for those who need family space and the ability to tow heavy objects. If the latter isn't a priority, well-equipped crossovers like the Acura MDX, Buick Enclave and Ford Flex offer the same or more cargo capacity and better fuel economy. The Aspen HEV hybrid matches them in the last regard, but given its high price, any fuel savings are wiped out. In other words, we suggest looking elsewhere. For more Style information, see our Compare Styles page. The Aspen is available in rear-wheel drive or 4WD. The standard engine is a 4.7-liter V8 good for 303 hp and 330 pound-feet of torque. A five-speed automatic is standard. Fuel economy is 14 mpg city/19 mpg highway and 15 mpg combined for models with 2WD. Four-wheel-drive Aspens with this engine have a 13/17/15 mpg rating. When properly equipped, the 4.7-liter-equipped Aspen can tow up to 5,950 pounds. Optional is a 5.7-liter Hemi V8 that produces 376 hp and 401 lb-ft of torque. A five-speed automatic is standard. Fuel economy is 13 city/19 highway and 15 combined with 2WD and 13/18/15 with 4WD. When properly equipped, an Aspen with the 5.7-liter V8 can tow up to 8,900 pounds. The Limited HEV is powered by a "two-mode" hybrid system consisting of a Hemi V8 (345 hp and 380 lb-ft of torque), two electric motors (87 hp and 235 lb-ft of torque) and a "two-mode" transmission with variable ratios, which maximizes power from the gasoline engine and electric motors. Estimated fuel economy is 19 mpg city/20 mpg highway. For more Performance Data, see our Specifications page. The 2009 Chrysler Aspen comes standard with antilock disc brakes, stability and traction control, trailer sway control and side curtain airbags. In government frontal crash testing, the Aspen earned a perfect five-star rating for the protection of front occupants. For more Safety information, see our Safety page. As a close relative of the Durango, the Aspen's cabin shares its strengths and weaknesses, but throws in some classy light wood accents for show. Chrysler's latest batch of digital entertainment options (a 30GB hard drive, satellite radio and TV) in particular should appeal to kids and tech-savvy parents. Ergonomics and storage capacity are first-rate, but overall materials quality is low-budget and not befitting the Aspen's luxury aspirations. Second-row legroom is tight, while the third row offers nearly as much space -- but that says more about the second row than the third. Large crossover SUVs like the GMC Acadia and Ford Flex are far more passenger-friendly. Most buyers will find cargo capacity to be more than adequate, with more than 68 cubic feet available when the third seat is folded into the floor, and as much as 102 cubic feet total. For more Interior Features information, see our Specifications page. Although the 2009 Chrysler Aspen's handling and ride characteristics certainly passed muster a few years ago, newer and more refined competitors have put the Aspen in a less forgiving light. The steering seems numb and ride quality is unsophisticated -- the available 20-inch wheels certainly don't help. Four-wheel-drive versions can be taken off-highway, offering plenty of wheel travel and responsive manners. The standard V8 is reasonably powerful, but with the Hemi V8, the Aspen is one of the quickest SUVs available for the money. Driving the Aspen HEV hybrid is a bit odd: It still feels trucky, but the Hemi roar has been replaced by a Prius-like whir at low speeds. Plentiful power is always on tap, with the electric motor providing endless torque. If you drive prudently, the 2009 Aspen HEV can remain in electric mode at low city speeds, thus maximizing fuel economy. 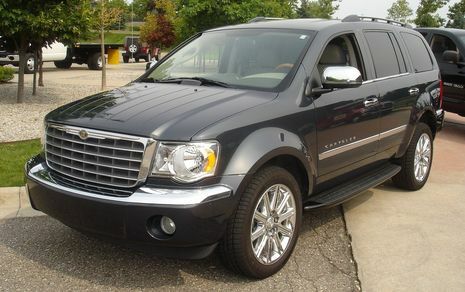 The Chrysler Aspen is Chrysler's first attempt at a mid- to full-size SUV, and while it is similar to its sister vehicle, the Dodge Durango, reviews read by TheCarConnection.com feel that it is suitably distinguished in terms of styling. New for 2009 is an Aspen Chrysler Hybrid, but unlike some hybrid variants from other automakers, Cars.com says the Chrysler "Aspen Hybrid doesn't look noticeably different from a regular Aspen [Chrysler]." The 2009 Chrysler Aspen comes in just one trim level, Limited—which also describes its exterior options. 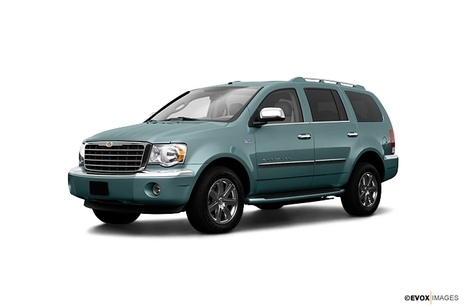 In fact, the only way to distinguish your 2009 Chrysler SUV from others that you'll see on the road is through the addition of 20-inch, 10-spoke wheels and running boards. Otherwise, all 2009 Chrysler Aspens feature somewhat subdued styling. Kelley Blue Book comments that the Aspen Chrysler's "face comes off as conservative—which isn't necessarily a bad thing." Edmunds reviewers say that this 2009 Chrysler offers "an upscale appearance," which Kelley Blue Book reports comes in the form of "a traditional SUV profile, with beefy, squared-shoulder styling." Identifying a 2009 Chrysler Aspen Hybrid from the exterior might prove to be a difficult task, as Cars.com finds that the Aspen Chrysler Hybrid's "styling falls more in line with the Toyota Highlander and Ford Escape hybrids, which look similar to their non-hybrid counterparts." Most reviewers agree with the editors at TheCarConnection.com, who feel that the interior is where this 2009 Chrysler really shines. Cars.com loves the "sharp navigation display" and "plenty of wood-like trim" that brightens up the interior ambiance. ConsumerGuide reviewers rave about the interior layout, finding that the "big gauges are easy to locate at a glance" and the "controls are logically arranged and clearly marked." However, they add that "small dial markings may frustrate some drivers." Edmunds also chips in by claiming that the 2009 Chrysler Aspen's "ergonomics and storage capacity are first-rate." Car and Driver reports that the Aspen Chrysler's "visual flair comes from two-tone leather treatments on the steering wheel and seats."